Unless it’s homemade, I’m not a fan of coleslaw. Too much rancid mayo, too few shredded veg, too gloopy by far. When I was in the Cork’s The Woodford recently, I ordered meatballs in a Cork-made blaa for lunch. On the side, and which almost put me off initially, was what the menu called Jacques’ ‘slaw. But this was no gloop-fest but, rather, a zesty, crunchy accompaniment which was more than a match for the spicy tomato sauce that covered the tasty meatballs. So, with the purchase of a white cabbage on Monday, this week has been the week of the ‘slaw. The picture doesn’t in any way do it justice. Lots of sweet and sour crunch with tart apples and flecked with hot chillis, it’s been eaten on the side of a (nearly) vegetarian lasagne, with cheese on toast, will be had with tonight’s Slow-Roast Pork Belly and I can’t wait to put it in a sandwich with some pork leftovers. This is something good to keep in the fridge, especially when it feels as if roots are the only veggies in town. Now, while you can shred the cabbage by hand, you may just use the will to live half-way through the prep. I use my wee food processor or, if you like living dangerously, you can always try a mandoline. After watching two of my very experienced teachers slice bits off their fingers while in Ballymaloe (in close up – on a big screen) I’ve never been able to face using one. But maybe that’s just me. 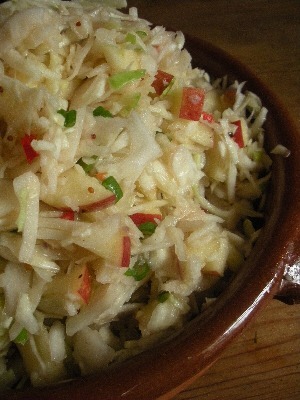 Place the shredded white cabbage, chopped spring onions, white wine vinegar, sugar and salt together in a large bowl. Toss well and leave to sit for 1 hour. Add the olive oil, wholegrain mustard, diced eating apples and red chilli. Mix thoroughly with some freshly ground black pepper and taste for seasoning. I think it’s the chilli that makes it so addictive. Glad you liked it, Gillian!